Top L-R Jovino Santos Neto, Randy Halberstadt, D’Vonne Lewis, Jacqueline Tabor, Wally Shoup, Michael Brockman. Bottom L-R Rob Homan, Andrew Morrill, Marina Albero, Victor Nguyen, Drew Pine, Rob Granfelt. All photos by Daniel Sheehan. 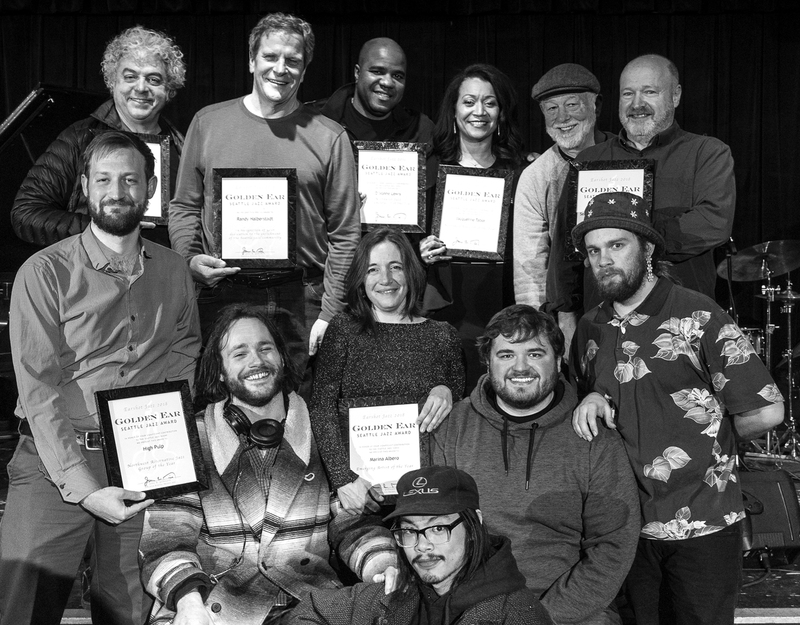 On the evening of March 11, Earshot Jazz presented the annual Golden Ear & Seattle Jazz Hall of Fame Awards in front of a full house at the Royal Room. The evening kicked off with an energetic set from Alex Dugdale’s Fade Quartet, who set the vibe with innovative hard bop interpretations of standards. Switching between alto and tenor, Dugdale displayed his trademark sound accompanied by pianist John Hansen, bassist Greg Feingold, and drummer Max Holmberg. 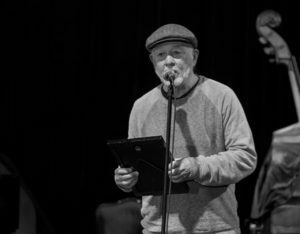 Jazz radio icon Jim Wilke emceed the awards in his usual style, blending his acute awareness of the current Seattle jazz scene with stories from its colorful past. Duende Libre is an eclectic trio that use the American jazz tradition as a launching point for global music exploration. Pianist/composer Alex Chadsey leads the group, with uber-talented bassist Farko Dosumov and percussionist Jeff Busch bringing the creative vision to life in vivid tonal colors. Vocalist Chava Mirel adds her free-flowing style in captivating form to the album. Drift, unites jazz with other cultural flows in continuous motion, defying musical and sociological boundaries. Marina Albero with Jovino Santos Neto. With a recording and performance résumé that dates back to his arrival in Seattle from his native Brazil 25 years ago, Jovino’s Quinteto exudes joy, celebration, and positivity like no other ensemble in the Northwest. The band perfectly expresses Jovino’s musical vision, influenced strongly by his mentor, Brazilian master composer Hermeto Pascoal. Bassist Chuck Deardorf, and drummer Mark Ivester have been on board from the beginning. Vibraphonist Ben Thomas joyfully brings the melodic qualities of the music bubbling to the surface. Jeff Busch is the glue that ties the rhythmic flow together through a stunning variety of percussion instruments. “I am honored to have received another Golden Ear Award, the fourth for my Quinteto since 2011. I am very proud of Chuck Deardorf, Ben Thomas, Mark Ivester and Jeff Busch for sharing this musical journey with me. No resting on our laurels—we continue to work together to show the invisible power of music to the world,” said Jovino. Rob Granfelt accepting award for High Pulp. It has been almost a year since the Northwest fusion band High Pulp released Bad Juice, a bright collection of tunes steeped in contagious grooves. The band has gained a reputation as purveyors of dance-inducing jams. Led by drummer Rob Granfelt, the group features a core quartet that mixes with a large unit of up to ten players. Bassist Scott Rixon, keyboardist Antoine Martell and guitarist Gehrig Uhles provide the dynamic flow of funk-infused rhythms supporting solo work from a cadre of horn players. 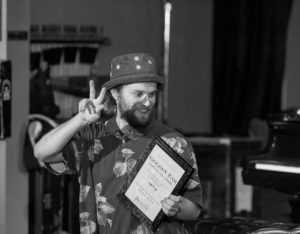 Most notable is tenor saxophonist Alex Dugdale, along with fellow tenor player Victor Nguyen, altoist Andrew Morrill, and trombonist Isaac Poole. High Pulp is young, open-minded, and unafraid to explore new territory. 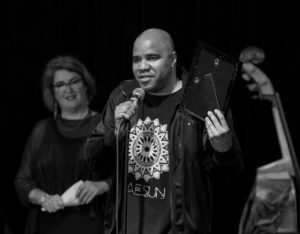 Michael Brockman accepting award for the SRJO. Since the beginning of her career working with her mentor and collaborator Gil Evans, Maria Schneider has possessed an intuitive feel for bringing out the best in a piece of music, and the ensemble that performs it. The four-time Grammy-Award winner brings amazing arranging chops, and an unmistakable humanity to the proceedings. SRJO musicians jumped at the opportunity to work with her, putting in long hours to master her complicated charts. 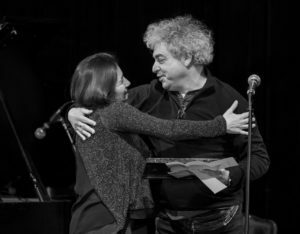 “Maria had a great time with everyone in the SRJO, and the band had an especially thrilling time working with her, and tackling her amazing music,” said SRJO director Michael Brockman. Schneider’s ability to bring out the best in an ensemble with her passionate, personal approach is legendary. On this November evening during the Earshot Jazz Fesitval, SRJO and the eager audience were the lucky recipients of Schneider’s gifts. The emergence of a great artist is something to witness over time. 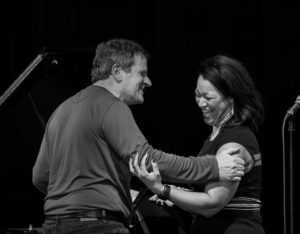 While Barcelona born pianist Marina Albero has made a large imprint on the scene since her arrival here in April of 2014, her “emergence” has been the linking of her creative life experience to the jazz tradition. The daughter of legendary Catalan musicians, Albero draws influence from them, and from her experience with classical, flamenco, and jazz forms. She delivers this multi-faceted approach seamlessly with joy and humility. 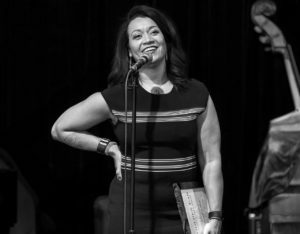 In her acceptance speech, Albero was grateful for being recognized as an emerging artist at age 39, after spending the last two decades as a dedicated mother. “I think back to when I was 20, I wasn’t playing music, I was raising kids. Thank you for saying you can never be too old to emerge, and that a woman musician can have a career after 40. This is my first award ever and I proudly hold it and offer it as an acknowledgement to these women who work hard in and out of home without any recognition, to these artists that are not that young when their art finally reaches an audience,” said Albero. With a new recording on the horizon, and live performances with a variety of Seattle musicians, Albero’s magnificent talents will continue to emerge, thrilling Northwest audiences along the way. D’Vonne Lewis with Rochelle House. D’Vonne Lewis is a whirlwind. As the leader of Industrial Revelation and Limited Edition, he has long established himself as one of the city’s most active artists. As an instrumentalist, Lewis’ work on drums, as a leader and a sideman, has reached iconic status. While Lewis is a product of Scott Brown’s nationally lauded program at Roosevelt High School, he ventured down a different path than most top jazz musicians of his generation. “I never went to school for music, so I’ve learned from everyone I’ve played with—Tim Kennedy, Joe Doria, Tom Marriott, Marina Albero, everybody. This is not for only myself, but for all of you, and my son Donovan,” he remarked. Lewis enters 2019 leading a new quartet named Passage, along with his well-established band, D’Vonne Lewis’ Limited Edition. Jacqueline Tabor’s success as a live performer, and as a recording artist is a testament to passion, hard work, and endurance. As a parent with a full-time job outside of her music career, Tabor has defied the odds by dedicating herself to her craft, displaying wisdom by surrounding herself with top shelf professionals. In her moving acceptance speech, echoing Albero, she spoke about her emergence as an artist later in life . 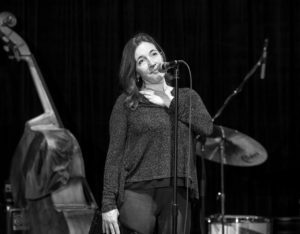 On the heels of her recent release The Lady in the Gown, Tabor offers her blues-infused brand of jazz interpretation in live performances throughout the region. Her art is sincere, with a deep connection to tradition. It comes from a place we can all connect with—the ebb and flow of everyday working life, combined with a creative impulse. 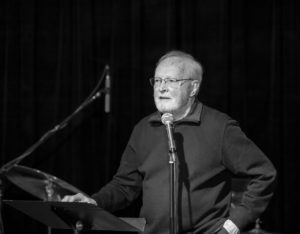 Bob Hammer enters the Seattle Jazz Hall of Fame as both a pianist and arranger, though it is the latter that has gained him world-wide notoriety for his work with Charles Mingus and Woody Herman. With Mingus (who referred to him as his Beethoven), Hammer arranged for such classic albums as Mingus Mingus Mingus Mingus Mingus, and The Black Saint and the Sinner Lady. His performance and recording résumé include stints with such jazz legends as Johnny Hartman, Jimmy Knepper, and Elvin Jones. At 89 years young, Hammer has received many accolades over his long career. 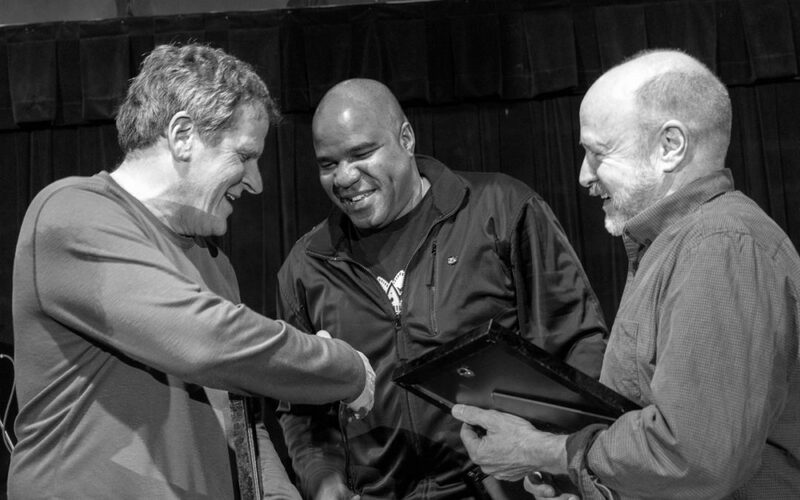 With this award, his major contribution to jazz music in this jazz community is firmly in place. 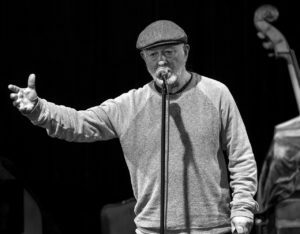 Saxophonist Wally Shoup has been thriving on the periphery of jazz during a career that has covered more than a half century. His penchant for redefining boundaries only to obliterate them has made him a legendary figure on the free jazz and improvised music scene. While many may hesitate to classify Shoup as a jazz musician, the open-minded Seattle jazz scene has always held Shoup in esteem. Shoup himself expressed his appreciation for that recognition. “This is very unexpected, what an honor. Seattle jazz scene, thank you for including me in the jazz world. I can’t thank you enough,” said Shoup. Helen and David Marriott Sr.
Having raised two of the true standard bearers of jazz in our community is, in itself, a major accomplishment. Helen and David Marriott Sr.’s decades of passionate support extends beyond their sons, David Jr. and Thomas, to encompass the jazz scene at large. David’s passing this past fall left a huge void in the heart of our community. It is always a pleasure when Helen attends a local performance. Through their passion and love for this community, they have created a legacy that will be impactful for decades to come. Randy Halberstadt being congratulated by Jacqueline Tabor. 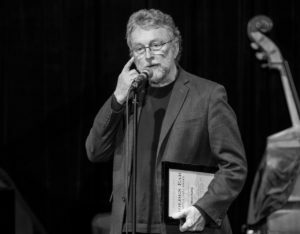 In recognition of his dedication to the enrichment of the Seattle jazz community, pianist and educator Randy Halberstadt received a special award for his four decades of dedicated service to our community. On receiving the award, Halberstadt joked that he would have to tell his wife that he hadn’t won in the categories he was nominated for, but instead received an “awesomeness award.” He’s not far off. Halberstadt recently retired from Cornish College of the Arts after a prestigious 40-year tenure. In tandem with his role as educator and mentor, he established himself as the pianist’s pianist, providing the perfect touch for area vocalists in particular. His work with the Seattle Repertory Jazz Orchestra gave him visibility to the jazz community at large. His recent Origin Records release Open Heart is giving him international recognition. Chuck Deardorf honoring Reed Ruddy. 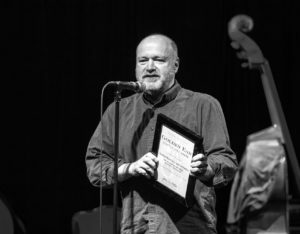 Bassist Chuck Deardorf, a Seattle jazz icon himself, presented a special award to Studio X manager and engineer, Reed Ruddy. While Ruddy and Studio X are largely known for their work with bands like Soundgarden and Nirvana, Ruddy’s work within the jazz community is legendary. Starting out at Kaye-Smith Studios, Ruddy’s work has spanned the transition from analog to digital technology, approaching both with his own “golden ear.” Recordings with his name stamped on them are assured to be of the highest quality. Ruddy is moving Studio X to Capitol Hill, as the historic building on 4th Ave. is set for demolition. We will always have the treasure trove of historic recordings to remember it by. At the heart of improvised music is the desire to link up (or sync up) with the ever-regenerative Spirit of life itself. As sounds collide through moment-to-moment inter-action and free association, form begins to emerge. In the hands of skilled improvisers, these forms cohere into whole phrases, which cohere into pieces, creating beauty whole-cloth out of ‘nothing’. This to me, mirrors the deeper energies that sustain life itself—creativity constantly re-creating itself.